The carefree days of summer are alive and well at Acorn Hill! The centerpiece of our day is play—free, creative and unstructured play, indoors and outdoors—the true work, joy and developmental training ground of young children. Monday—Friday. Sessions are 2 weeks. 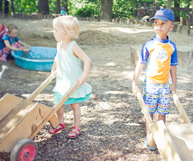 The morning begins outdoors, where children experience the beauty of our wooded playground, atop a hill adjacent to Sligo Creek Park. 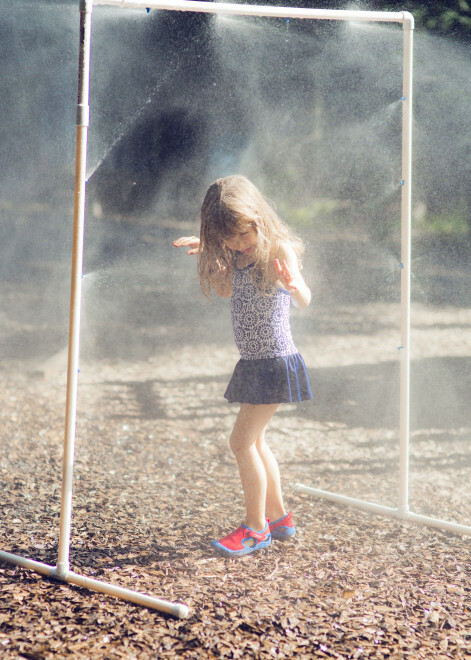 Sandcastles, complete with moats and water; water play and mister; or bubbles, iridescent in their airy journeys, are among the children’s playthings. Indoors, our teachers provide a rhythm of activities designed to bring balance to a child’s day, and a wealth of natural materials to give wings to the imagination. Each week includes lively stories and puppet shows, singing and circle games, crafts, painting, gardening and baking or cooking, and a weekly walk to Sligo Creek. Our Summer Program is taught by our own teachers who are experienced Waldorf early childhood educators. It is open to children between the ages of 3½ to 6¼ as of June 1. Children must be fully toilet trained. Class size is 16 children with 2 teachers. A wholesome morning snack is provided. Children stay for lunch and bring a packed lunch from home.